Finding the perfect concealer is probably one beauty dilemma that is plaguing many women. A liquid formula concealer offers moisture but lacks in coverage, while a balm-type concealer gives the ideal coverage but tends to be dry and result in a cakey texture, resulting in fine lines on the area it's applied on. At the forefront of K-beauty, the researchers at Laneige has identified this issue and developed their very own Watery Cushion Concealer to address the concerns. With Long Lasting High Covergae that adheres like a second skin and dual effect moist flocking puff that lightens blemishes with repeated use. Using feather-light strokes, apply Laneige Watery Cushion Concealer on concerned areas and blend using the ring finger in a gentle tapping motion. Available in three shades. 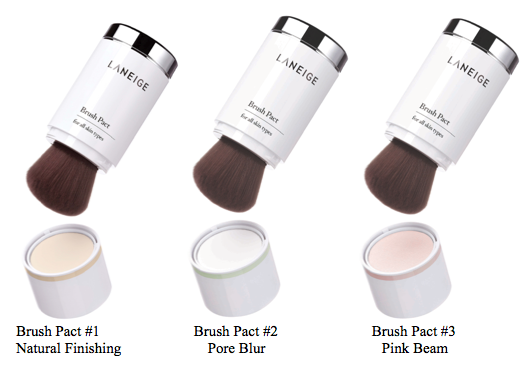 Laneige Brush Pact offers convenience and easy touch ups even on the go. Made from 100% artificial hair that is thinner and softer than natural hair, the Soft Sensation brush is of the highest quality brush in the market, and provides the delicate and detailed finishing that looks as if it's done by a professional makeup artist. The unique brush provides a soft silky feel with its 0.05mm thick, densely made brush that pick up more powder compared to other common brushes. For and even spread without streaking and is not easily damaged even after repeated use and wash. Available in 3 options to help women create different textured look by highlighting different details of the skin - #1 Natural Finsihing, #2 Pore Blur and #3 Pink Beam.